Look at that crispy edge. You’re gonna want that crispy edge. Trust me, I ate a circle around the pan to confirm it’s the best part (and it totally is). 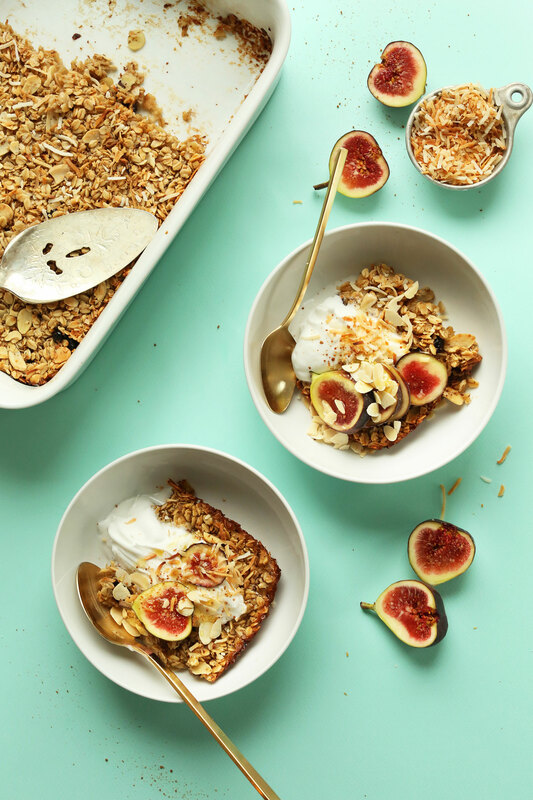 This baked oatmeal is the perfect dish for lazy weekends, hosting a house full of guests, or brunch, because it’s quick and easy and it feeds a crowd. The recipe comes together in about 1 hour, requires just 10 simple ingredients, and is vegan, gluten-free, naturally-sweetened, and vegan butter-free! Whew, that was a mouthful (but so worth it). This oatmeal is inspired by a recipe I saw in Real Simple magazine that immediately caught my eye. Only this version is egg-free, and infused with coconut three ways. That’s right THREE: Coconut flakes, coconut milk, and coconut oil. That’s a lot of coconut, and it’s oh-so-delicious. You really don’t need much in the way of toppings. In fact, just pour on some almond milk and call it breakfast! But if you wanna get all fancy, coconut whipped cream, figs (or fresh fruit), and toasted coconut make a perfect finishing touch. This would make a dreamy weekend breakfast, or even one you could make ahead of time and reheat throughout the week for a quicker meal option! It’s especially ideal throughout the winter, especially when hosting guests – it’s the ultimate warming, comfort food. If you aren’t into coconut, don’t worry! Simply swap out the coconut milk for almond, and the coconut flakes for something that sounds more your style, like chocolate chips (ey-oh)! If you give this recipe a try, let us know! Leave a comment, rate it (pretty please), and don’t forget to tag a picture #minimalistbaker on Instagram! We’d love to see your breakfast in action. Cheers, friends! Delicious baked oatmeal infused with coconut in three ways: coconut flakes, milk, and oil. Made with 10 ingredients, naturally sweetened, and perfect for hosting! Preheat oven to 350 degrees F (176 C) and grease a 2-quart (or similar size) baking dish with coconut oil (or vegan butter). Prepare flax eggs in a medium-size mixing bowl. While the oven is preheating (and isn't quite at 350), add shredded coconut to a bare baking sheet and bake until just slightly golden brown - about 3-4 minutes. Watch carefully as it browns quickly. Set aside. 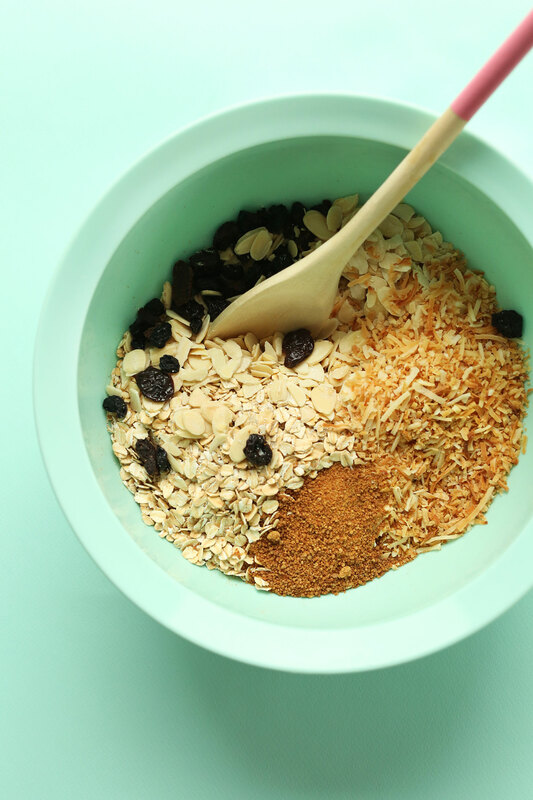 To a large mixing bowl, add oats, almonds, half of the toasted coconut (reserve the rest for serving), dried fruit, coconut sugar, and salt. Stir to combine. Add maple syrup and non-dairy milk to the flax eggs and whisk thoroughly to combine. While whisking, pour in the coconut oil and whisk thoroughly to combine. (NOTE: If the mixture gets clumpy, microwave for 10-20 seconds to re-melt coconut oil. However, it will melt in the oven while baking so it's not a big concern.) Add wet to dry and mix. Pour oatmeal into prepared dish and bake for 37-40 minutes, or until slightly golden brown and firm in the middle. Then increase heat to 400 degrees F (204 C) and bake 5-8 minutes more to brown the edges and crisp the top. Serve warm with desired toppings, such as coconut whipped cream (or coconut milk or almond milk), extra toasted coconut, and fruit. Best when fresh, though leftovers keep covered in the refrigerator 2-3 days. Reheat in a 350 degree oven, or the microwave. *Recipe adapted from Real Simple. *Nutrition information is a rough estimate calculated without additional toppings. *For information on freezing, see this resource. What does 2 batches of flax eggs mean? How many total eggs? Hi Gwen, 2 batches flax eggs is 2 Tbsp flaxseed meal (14 g) + 5 Tbsp (75 ml) water. You can refer to our Recipe FAQ if subbing chicken eggs. Hope that helps! I really love this recipe! I’m not vegan, and I did not have flax anything or coconut oil, so I used regular eggs and butter. I also used Macadamia milk since it peaked my interest at sprouts. Overall this recipe is very easily adaptable to whatever you have in your kitchen, and I’m really enjoying it! I am pregnant and have been having coconut cravings so decided to make this and it did not disappoint! I used all coconut milk (from carton), pecans instead of almonds (due to allergy), omitted the coconut sugar (it was still plenty sweet), 1/4 tsp coconut extract. Delish! Thanks! Prepared this yesterday, and I am quite happy about it – having it now for breakfast. Instead of coconut oil, I used more light coconut milk, used thinly sliced almonds instead of slivered ones and also added less sugar (also xylitol instead of coconut sugar). Reheated it this morning, added a tiny bit more light coconut milk and fresh strawberries… Delicious! Next time, I am going to experiment adding vanilla, cinnamon, and inspired by one of the comments, frozen berries instead of dried cranberries. Looking forward to this experiment. Thank you for sharing yet another delicious recipe with us, Dana! 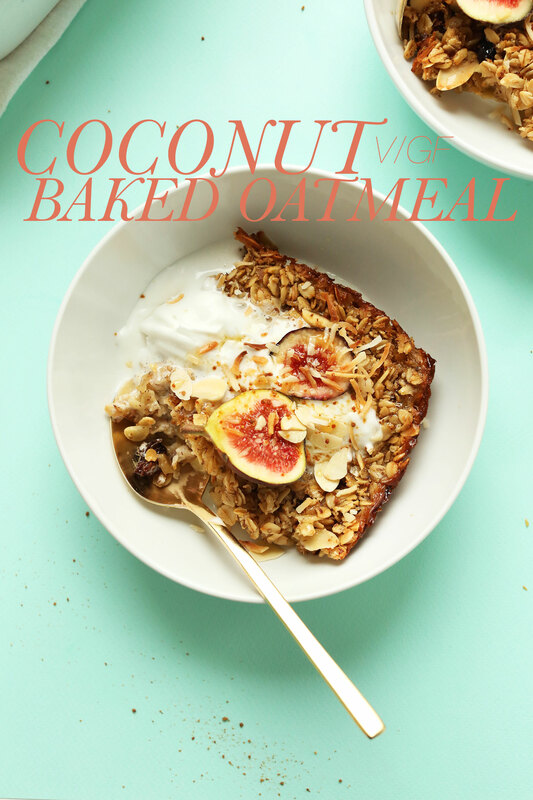 We love coconut in our family and I wanted something to switch out our stovetop oatmeal and this did it! I first made it in mini-muffin tins and without liners it was hard to get out but still delicious! I have a pan version in the oven now for breakfast in the morning! This was delicious, I didn’t have ground flaxseed so I just used flaxseed (the seeds itself) and added a mashed banana and had wonderful results :) I was 1 cup short on oats so I added wholewheat flour instead and a bit of baking powder, it turned out more fluffy but still crispy on the edges! Smart! Thanks for sharing, Charlotte! I’ve made this before and its wonderful. I want to make it tonight, but don’t have any dried fruit on hand (and am trying to clear out my freezer). Do you think you could use frozen berries instead of dried? If you were to throw some chocolate chips in, would you leave out the dried fruit? Having some family over on Christmas morning and planning to make this. Sounds amazing! This was delicious! I used all almond milk, dried cranberries, and topped with raspberries – wonderful!! I mixed all the dry ingredients together at night so that all I had to do when I woke up was add in the wet ingredients. 5 minutes in the AM and I had a delicious hot breakfast! I will totally make this again! This recipe sounds amazing! I’ve been wanting to try baked oatmeal for a while but was convinced I wouldn’t be able to find a good vegan recipe. Then I found your site. Yay! Anywho, do you have suggestions for Maple syrup and sugar substitutes? If possible, I’d like to use puree fruit as the only sweetener. Thank you!! Why have I never heard of baked oatmeal until now?? I love oatmeal in cookies but am not a fan of it in liquid/cereal form. This has a cake-like texture and is seriously delicious. I used chia instead of flax eggs and all vanilla soy for the milk. I added chocolate chips to the batter but served it as-is (no toppings). My son and I had it fresh for breakfast yesterday and re-heated today, and it was equally good both times. This is sure to be my new go-to breakfast recipe! Hey Girl I’m totally going to try this!! I tried making the coconut yogurt and I’m on day 2 and it’s still liquidy, no solidity at all…it’s been room temp, covered with the cheese cloth. Not in sunlight. Am I doing something wrong. I used the Whole Foods 365 full fat milk?? This oatmeal was delicious and super easy! I wanted to try baked oatmeal because I saw an episode of Diners, Drive-ins, and Dives (I know, but seriously) where a restaurant served their oatmeal like this. BUT they cooked it and then baked it on a baking sheet so it got kind of crunchy and they served it with milk almost like cereal. I really wanted to try that so today I reheated my oatmeal in the oven at 400 degrees for 10 minutes on a baking sheet (I crumbled it up.) It was delicious and even better than the first day! Thanks for this recipe! Thanks for this recipe. I made it for breakfast this morning and I loved it. I absolutely love this recipe! I’ve made it every week for the past three weeks! Do you think it would freeze okay if I wanted to make it a week ahead of time? Do you think I could make this with chai eggs instead? Still searching for flaxseeds in my local supermarkets! I served it with almond/coconut milk blended with mashed over ripe bananas. Excellent! Dried mango was a tasty and tropical addition. Next time I’ll use less coconut oil though…it was a tad greasy. I have made more than one of your recipes, I have cooked some of them twice and I have left a trail of comments probably longer than three. I am not vegan, vegetarian or eat gluten free. But I do believe in homemade, no added extras and experimenting with ingredients that pose a challenge or deliver a interesting flavour. Many times I read a recipe that tickles my fancy, but I don’t have the ingredients on hand and it silently it slips from my mind. And that is what I love about you as Minimalist Baker: Your recipes are simple, quick and most importantly requires ingredients I usually only have to walk to my kitchen for. THANK YOU for staying on my recipe radar and allowing me to easily have fun in the kitchen. That is why I cannot wait to prepare this breakfast for my family tomorrow morning and show them how doable healthy and delicious can be!! You forgot to mention the coconut sugar! So there are 4 sources of coconut in the recipe…can’t wait to try it! Do you have any suggestions on how to make this with soaked oats? Thank you for posting this, Dana. This works perfectly for my request in November for some type of oatmeal cake. I made this for the elderly woman I take care of occasionally. She does not have access to anything to heat up food except a toaster, so I cut the baked oatmeal into generous squares and wrapped them individually so they could be doled out each evening for her to toast in the morning. I’m don’t care much for oatmeal myself, but she loved them, and they held up well for the week that I had them. Thank you again for a brilliant solution. Made this twice now and I LOVE IT! It definitely takes me more than five minutes to prep (more like 20). The second time around I added some ginger and cinnamon for some added flavor. I’m not vegan, so one day I served it with yogurt and that was delicious! Next time I’m trying the coconut whipped cream…! I love baked oatmeal, but having switched to a gluten, dairy and egg free diet for health reasons, I thought I’d never have it again. As soon as I saw this, I planned to make it the next Saturday. It was GREAT. Everyone in my family came back for seconds. I used chia seeds instead of flax, and a little more coconut milk than almond milk, and gluten free oats. Oh, and sliced instead of slivered almonds. I didn’t use the toppings, just poured some heated almond milk over it. My husband and daughter added blueberries on top. I’ll be making this for Christmas morning next year, it’s that good. Thanks for making these vegan, gluten free recipes! Mind blown! Made this on Sunday morning and it was gone in the blink of an eye. All kids ages 6 and under inhaled it. I almost skipped the toasting the coconut step, just because I was running very low on time. Glad I didn’t. It was the best part! THANK YOU! I will be making this recipe often. You’re the best! This is in the oven right now. I’m not vegan, but for some reason the thought of putting eggs in baked oatmeal icks me out, so I always look for vegan baked oatmeal recipes. Thanks for the catch! Added. Any suggestions for a family member who can’t eat shredded coconut? Do you think I should up the amount of other dry ingredients? I wasn’t sure if it would mess with the texture too much. You’re right I do want that crispy edge!!!! I made this last night for this morning, but when I came to serve myself this morning half the edge had been stolen. I wonder who did that? My flatmates love it also! Any alternatives to the almond/coconut milk for those who are allergic to both? Thanks! I would say rice milk! Made this today! I added a little vanilla and almond extract–which I love with coconut–and resisted the urge to add cinnamon. Perfectly sweet and so yum. Making this again very soon. Love to have ready to go breakfasts for my daughter. Thanks. Yay! Thanks for sharing, Holly! This looks so delicious, Dana! I love coconuts and I can’t wait to give this a try! :-) Thanks for sharing! This is great I used to make an oatmeal breakfast bake before I was vegan and this seems very similar I will definitely give this a try. Thanks for sharing. Instead of dried fruit do you think it would work with frozen fruit? What I think I am starting to love the most about your recipes is that I seem to have most of the ingredients on hand already, making the inspiration to make this deliciousness that much closer! Making this as soon as possible! Yum! Adding a dollop of coconut whipped cream on top of my piece while still warm made this coconut lover one happy girl! I love baked oatmeal, and this has become one of my favorite recipes. Thank you, Dana! So great! Thanks for sharing your substitutions! This looks incredible! I can’t wait to make it! 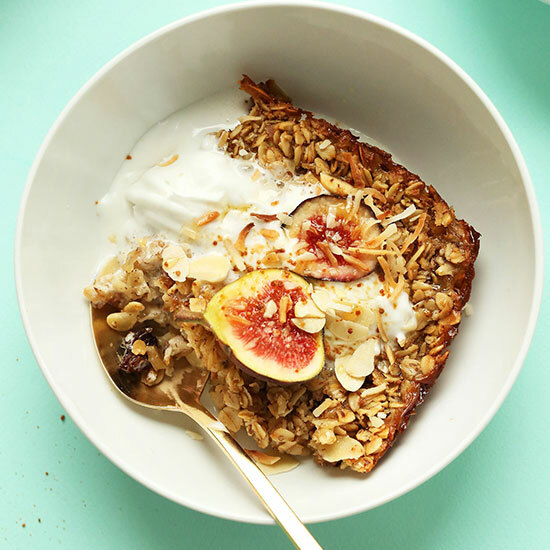 I love baking my oatmeal–it tastes so cake-like and fluffy! 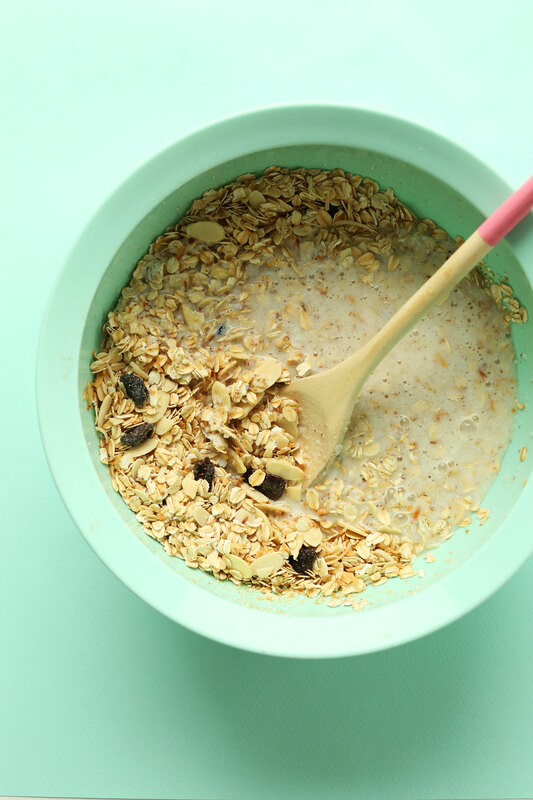 This is a fantastic way to add a coconutty flavor and indulgence in your oats! I love huge granola clusters, so this is a cluster lovers’ dream!! It’s basically just a huge cluster of granola! Genius!! I cannot find fresh figs to save my life right now. Where did you get yours? Also this oatmeal is totally going on the list. Hallo beautiful wholesome pan of oatmeal! Toasted coconut in oatmeal is the BEST! Looks amazing! Do you think I could prep this the night before and cook it in the morning since the oil melts again in the oven? Or maybe just bake it the night before and reheat? Which do you think would be better? And last question: To make it a bit bigger and fit into a 9×11, woud you double or do 1 + 1/2 on the ingredients? If I were you, I’d bake it and then reheat the next day! I wouldn’t double the ingredients, I would do 1.5x as you said. Good luck! ooooooh….. I love how theres been no going easy on the coconut! I can already tell this is going to be my new favorite breakfast recipe! Loving all the ingredients you used here! Pinning! I usually cook oil-free. Is there a purpose for the oil in this recipe that would make it fail if I left it out? It helps moisten the oats and also crisp up the edge. But you can probably leave it out and sub a bit more coconut milk. I’ve made this with absolutely no oil at all and it’s great! Today I’m making it again, a bigger batch, leaving out the nuts and subbing more dried fruits. That way, when I have it for breakfast, I can decide at that time if it’s a nuts & seeds morning or not. Planning on introducing houseguests to this next week! What’s the thought on using real eggs instead of flax eggs? Kosher? Same ratio? Yes! I would use the same ratio. So tempting! I don’t have any slivered almonds. Could I just leave them out or what can they be substituted with? Thank you! Hmm, I would suggest subbing chopped almonds, if you have them. Or pecans! I have all of these ingredients and will be making this ASAP. Like tomorrow. Looks delicious! This looks so tasty and I definitely want the crispy edge bite! Think these would work in a muffin tin, to make portable, individual portions?? The recipe sounds delicious, and I would love to try them in a muffin pan form! Oooo can’t wait to try this out! Looks so warm and delicious! 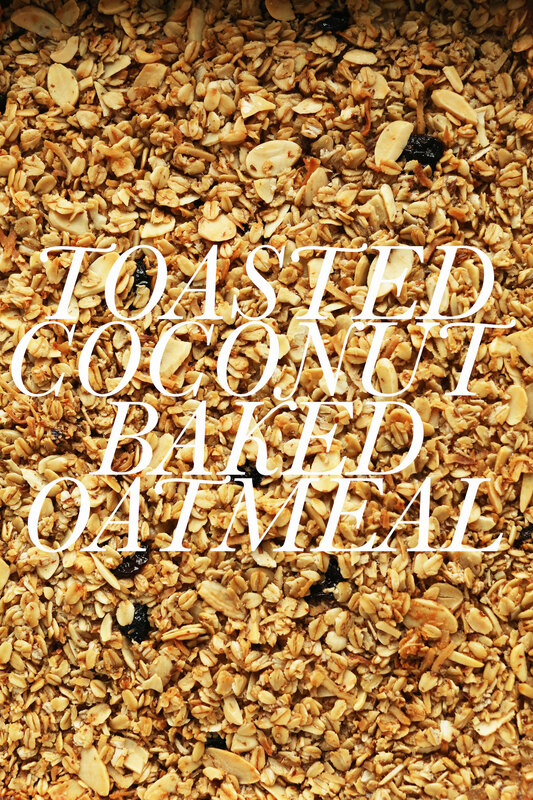 I almost always put coconut in my oatmeal – it’s such a great combination! Can’t wait to try this!! I have been searching for weeks for a good vegan baked oatmeal recipe. I’ve tried many and felt totally underwhelmed by all of them. But here you are to the rescue! Can’t wait to try it this week! This looks absolutely INSANE! In the best way. I’m definitely going to try this one – thank you! I was wondering if there was an easy way to make these into a portable snack? Maybe bars? Would you suggest using a larger pan to spread it out and make it thinner and then cut into bars? Hi Tarra! I have a breakfast cookie coming up that might be a better option! Otherwise, try making them in a muffin tin and baking them longer so they crisp up! Good luck! Thank you so much…Looking forward to the breakfast cookie recipe! This looks beyond gorgeous Dana! 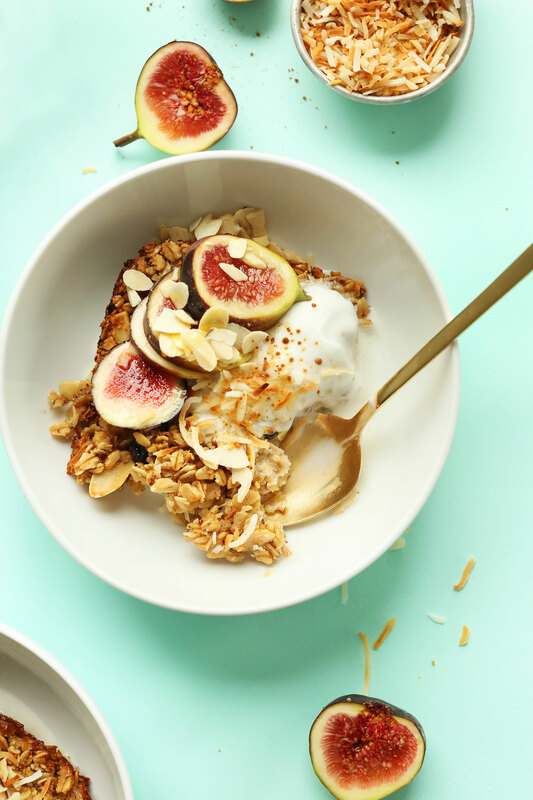 I love all of your oatmeal recipes and can’t wait to add this one to my collection :) Also, love the idea of topping with figs…I have always wanted to give those gems a try! Mmmm, this looks heavenly delicious! I love the combinations here, will add to my breakfast rotation for sure! Thanks for sharing! This looks amazing! I love coconut! The fresh figs are beautiful. Again, fresh figs are something I can’t seem to find here in Iowa :(. But I’m sure any type of fresh fruit would be delicious. Blueberries and coconut go well together! This looks seriously delicious and I will give this a try. Oatmeal has been on my breakfast list a lot lately. I want to try this in granola form so all the bits are crunchy! Sounds delicious! Whoa, that’s a brilliant idea!!! Sparkle right there. Had baked granola for the first time Christmas Eve, my mom made it. We have a tradition of making breakfast for dinner on Christmas Eve and then go to the service together. Loved it! Was hesitant to try, but wife had already scooped some on my plate. The crispy edges are shockingly the best. Didn’t think to add coconut flakes though.